(PRLEAP.COM) Denver, CO: February 8, 2019 marks the fourth consecutive year that Accountingprose has been recognized as a Top 50 Cloud Accountant by Hubdoc, a leader in cloud accounting technology. In addition to providing a baseline of outstanding customer service, Accountingprose was singled out this year for its heightened focus on putting people first; both inside and outside of the company. 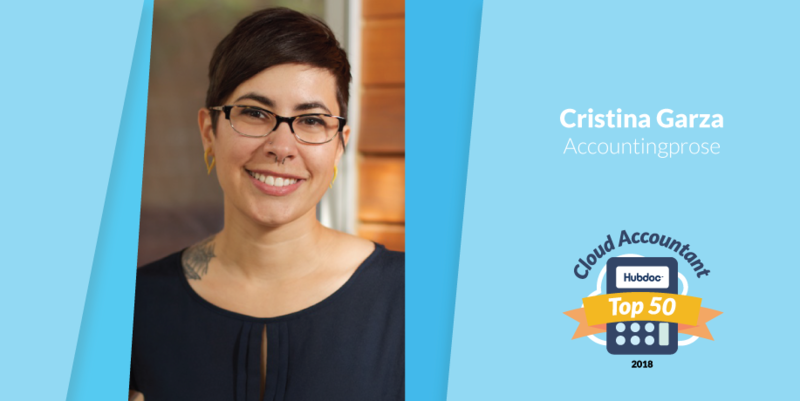 The opinionated deployment of cloud technology by Founder Cristina Garza and her team of Small Business Superheroes has already proven to benefit and delight clients. The firm is being recognized for the fourth year due to its relentless improvement (kaizen) building customer delight by way of making work more joy-full. Building up everyone they work with, keeps Accountingprose at the forefront of cloud accounting today and into tomorrow. Accountingprose customer and founder of modern mega-success story Design Pickle, Russ Perry, agrees; finding increasing value in having a team like Accountingprose to rely upon: "I FREAKING LOVE Accountingprose!…" elaborating: "Thank you for the streamlined process, total accountability and awesome vibe and culture. I would recommend them to any small business or entrepreneur." The ability to count on the numbers adding up at the end of the year grants a peace of mind many small business owners find indispensable. Mike Arce, Founder and CEO of Loud Rumor couldn't agree more, saying: "Accountingprose Small Business Superheroes are amazing! It's so great to meet a bookkeeper that actually understands 1) technology and 2) that the goal should always be to make things easier for the client…" summing up his experience as a founder thusly: "My experience has been amazing so far and I'm so glad to have started with them!" Having taken Accountingprose from its humble beginnings to over seven figure yearly revenue, and hearing consistent positive feedback both from clients and peers in the industry, Accountingprose has doubled down on the recipe for success that lead them to where they are. Simply put? By improving the experience of the people using technology, Accountingprose can stay ahead of any potential dissatisfaction while providing customer delight. The metrics matter, but only so far as they impact the lives of the people involved. Accountingprose: Award-winning, tech-focused, cloud-based small business accountants based in Denver, Colorado and Phoenix, Arizona. Our Small Business Superheroes do the heavy lifting so you can get back to your happy place.